I always have more than enough lip balms stashed away in every accessible place in my home. This hydrating natural lip balm provides quick relief to severely dry lips leaving them feeling smooth and healthy for hours. 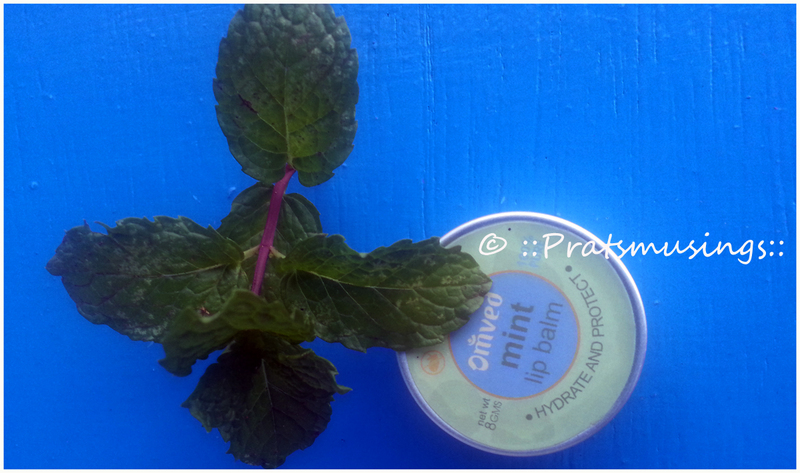 Omved Mint Lip Balm is a light very lip balm that is infused with the goodness of kokum, shea butter, almond and mint oils. 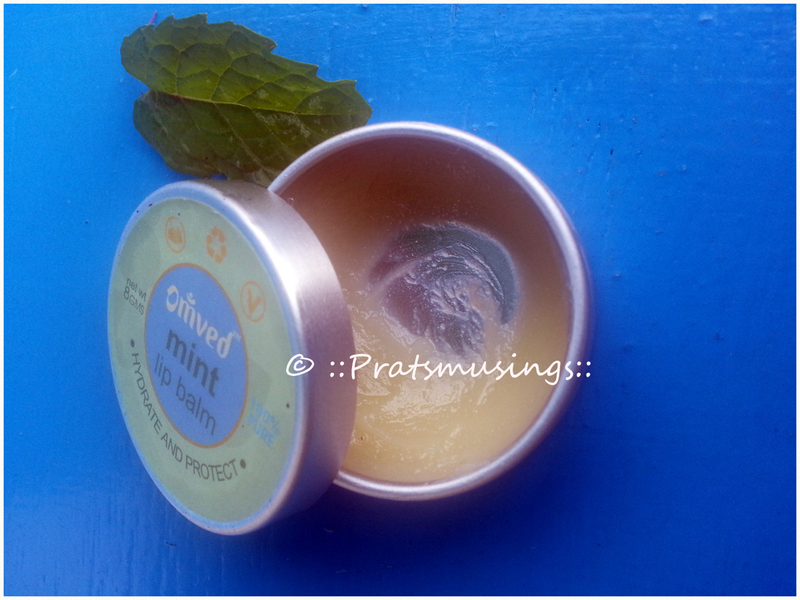 One thing good about this balm is that the fragrance is not very over powering like most mint based products. The balm has a grainy texture and it melts when it gets in contact with your finger. And trust me, you need really very little of the lip balm to keep your lips hydrated. I use this lip balm even for my twin boys who are 4 years old because it is all natural and organic. So it is safe for use for kids too. This small tin of lip balm weighs 8 gms and is priced at Rs. 250. It has a shelf life of 15 months. Since the tin is small, it is travel friendly. I need to add here that I also use the Cinnamon Lip Balm by Omved and in both the lip balms, the lid is a little loose and that stops me from keeping it in my purse because the lid may just open. I love the tin packaging, maybe they should just get tighter lids or boxes. You can buy this from the Omved Online Store, Omved stores in Mumbai, Healthkart and Purplle. * Kokum Butter, one of nature’s richest emollients, soothes and moisturises dry lips and seals in hydration. 100% natural. No synthetic agents. No parabens, sulfates, silicones, petrochemicals, glycols, phthalates, synthetic colours or perfumes. 100% pure therapeutic essential oils, blended in cold-pressed plant oils. Contains only herbal actives – pure botanical extracts in a natural skin and Earth-friendly base. Butters of Kokum (Garcinia indica) and Shea(Butyrospermum parkii) with oils of Sweet Almond (Prunus amygdalus), Macadamia (Macadamia integrifolia) and Sunflower (Helianthus annuus) therapeutic-grade pure essential oil of Mint (Mentha Sativa) blended in a pure skin and Earth-friendly natural base with Ascrobyl Palmitate ( Anti-oxidant). 100% biodegradable formula and easily recyclable packaging. Verdict : I liked both the balms and I’ve stashed away the cinnamon one for use in winter, because it has a warm appeal to it. The cinnamon keeps your lips warm. I prefer the mint one for the summer because it is more refreshing and provides adequate respite in the scorching heat. But if I had to pick one, it would be the cinnamon. You must! I love them because they are absolutely natural. And I don’t find it expensive. The FE balms looked very vaseline type so i have never purchased it. I love the cinnamon one, it leaves a warm feeling post application.